Sara has had the opportunity to work in a variety of practice settings, including 25 years in a medically under-served community. She spends about 80 percent of her time practicing in an internal medicine office where she sees a variety of adult and geriatric clients with a wide range of problems. On the majority of days you will find a student by her side. 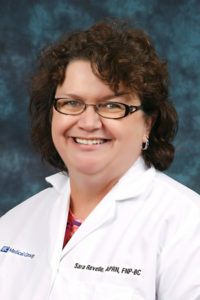 In addition to being a family nurse practitioner, she is also nationally certified as a geriatric nurse practitioner. The remaining 20 percent of her time is spent teaching advanced practice nurses at the graduate and doctoral level.